Seafood risottos are one of the great joys in life, especially when they are made with fresh stock and fresh ingredients. Unlike terrestrial meats and stocks, those made with the fruits of the sea are zephyrs: Make them, enjoy them, and move on. They don’t store well at all. 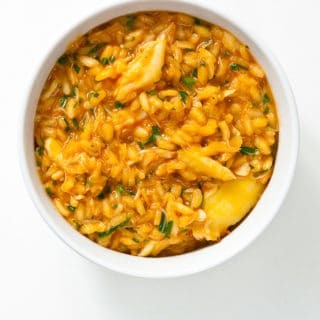 I make this risotto to celebrate our Dungeness crab season, but you could use blue crabs in the East, Jonah or stone crabs — even snow or king crab meat. And yes, you could use lobster, too. The key here is good stock. You should make crab stock special for this recipe, but you could use a high-quality fish stock instead. If you don't have access to either, use good vegetable stock, or even water. One note: If you use a salty broth or stock, taste the risotto as you go, and switch to water once the dish is salty enough for you. Pour the stock into a pot and bring to a bare simmer. Heat the olive oil in another pot over medium-high heat for a minute or two. Add the garlic, rice and tomato paste and stir-fry them until the garlic just begins to brown. Pour in the Marsala and stir vigorously. It will combine with the tomato paste to make a thick slurry, so start pouring in your crab stock, 1/2 cup at a time. Stir well to combine.Sprinkle a little salt over everything now -- unless your stock is already salty. Stirring constantly, let the liquid evaporate. When the pot is nearly dry, add another half cup of hot stock. Keep doing this for about 15-20 minutes, until the rice is al dente. 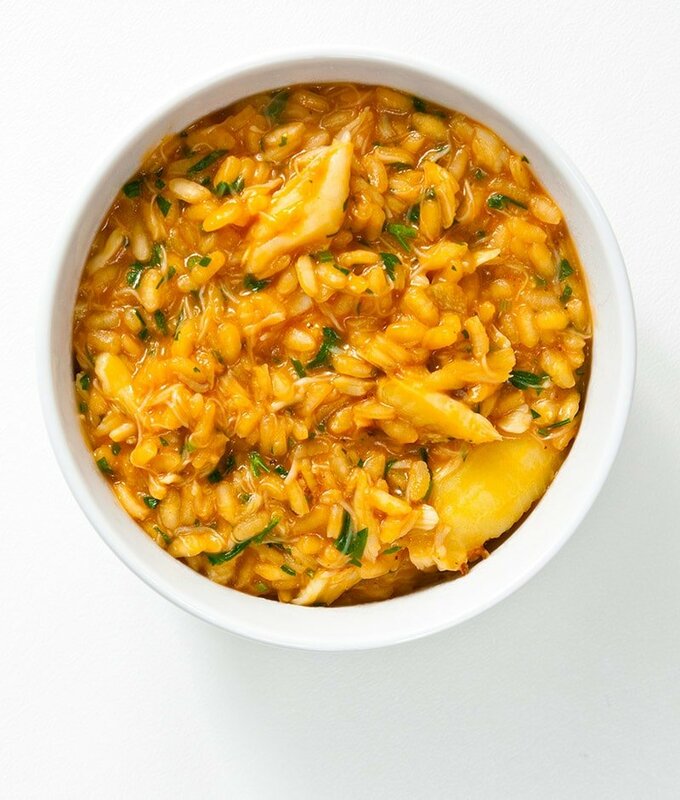 Once the rice is cooked, add a little more stock, the parsley and the crab meat and stir to combine. Turn the heat to low and stir until the crab is heated through. Serve at once. You need risotto rice here; long-grain will not work. Use Vialone nano if you can find it; it is especially good with crab, fish and shellfish. Made this risotto the other day and loved it! Tonight, with the left overs, I made risotto cakes and did a version of eggs Benedict with them instead of English muffins. Threw a slice or prosciutto, tomato and acacodo on there and it was amazing. I just have to thank you for this recipe. I made it this weekend, with the crab stock, and it is seriously the best thing I’ve ever eaten. I got 10 lbs of king crab from Alaska this year, and I was looking for something new to do with it. I used the meat from 1 dungeness crab with 2 gigantic king crab legs and it was just perfect. I mean seriously the best thing I’ve ever made, and all I had to do was follow this fantastic recipe. Thank you! I made this crab risotto recipe for dinner tonight with the crab stock recipe and dungeness crab that my commercial fishing daughter brought me while fishing out of Newport, OR. It was pretty good, although just to be honest, it isn’t my favorite way to use fresh crab in a recipe. The only thing I changed was I only used 1/4 cup chopped parsley instead of the 1 cup (I thought the 1 cup would be way too much) and the dish did turn out looking like the one in the picture.